A real estate investment trust (REIT) is a company that uses the combined capital of a large number of investors to buy and manage residential, commercial, and industrial income properties. Like other equities, publicly traded REIT shares can generally be bought or sold in a moment on an exchange, making them more liquid than physical real estate investments. Owning REIT shares can also be much more convenient, because investors do not have to manage property rentals and maintenance. Equity REITs are effective income-generating assets, but share prices can be sensitive to interest rates, partly because companies often depend on debt to acquire rent-producing properties, and higher rates can affect real estate values. As rates rise, REIT dividends may also appear less appealing to investors relative to the safety of bonds offering similar yields. Solid economic growth and low unemployment (which tend to spur higher wages and inflation) are typically viewed as strong fundamentals for the real estate market. If these trends continue, well-positioned REITs may be able to raise rents and increase dividend payouts despite rising rates. After the new tax law was enacted at the end of 2017, some investors may have shifted out of REITs because they don’t benefit directly from steep tax cuts that are expected to boost the profits of many other public corporations. REITs don’t pay corporate taxes because they are pass-through entities that distribute most of their profits to shareholders. The real estate industry’s business models and ties to underlying property markets produce a distinctive risk-return profile. 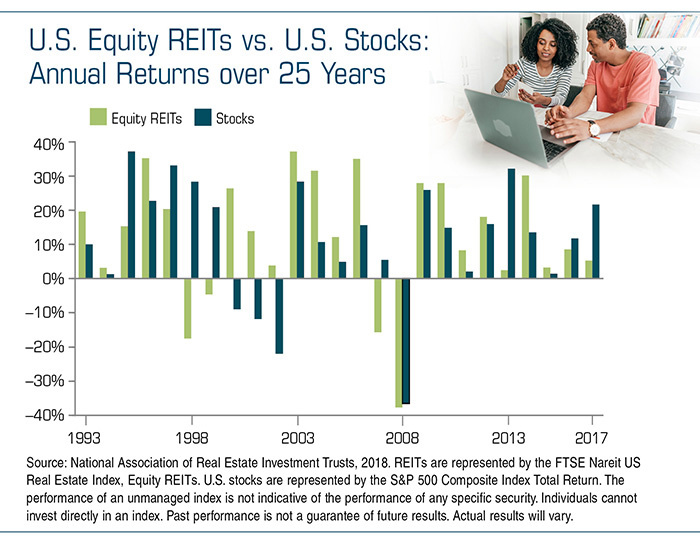 Because the share prices of equity REITs don’t rise and fall in lockstep with the broader stock market, including them in your portfolio could help increase the level of diversification. Diversification and asset allocation do not guarantee a profit or protect against investment loss; they are methods used to help manage investment risk. The return and principal value of all stocks, including REITs, fluctuate with changes in market conditions. Shares, when sold, may be worth more or less than their original cost. There are inherent risks associated with real estate investments that could have an adverse effect on financial performance. Such risks may include a deterioration in the economy or local real estate conditions, tenant defaults, property mismanagement, and changes in operating expenses (including insurance costs, energy prices, real estate taxes, and the cost of compliance with laws, regulations, and government policies). Registered Representative offering securities through American Portfolios Financial Services, Inc. Member FINRA/SIPC. Investment Advisory products/services are offered through American Portfolios Advisors, Inc., an SEC Registered Investment Advisor Clarity Wealth Management is independent of all other named entities.